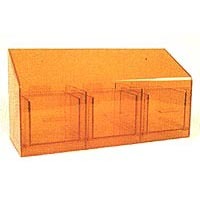 Holder for any cleanroom items that need to be stored. Available in clear and other colors. An acrylic holder for any cleanroom items that need to be stored. Available in clear and other colors. Available as a 4 to 6 bin compartment with individual door compartments or one solid compartment.